I LOVED working on this book, so much so that I wished I could have spent a solid year on the research alone (and while we’re dreaming, another year just for painting!). Even without that kind of time, I did fit in as much reading and researching about Tolkien’s life as I could while in the midst of concepting, sketching, inking, and painting. But when I began reading literature on Tolkien (I highly recommend J. R. R. Tolkien: A Biography, written by Humphrey Carpenter), I kept feeling the need to see the locations for myself. Tolkien lived primarily in Birmingham and Oxford, England. The practical side of me thought that probably all the info I’d need could be found online, but the creative side in me pushed and prodded, and I decided to invest a chunk of my book schedule time and a hunk of money on taking the trip there for research. And I’m SO glad that I did! 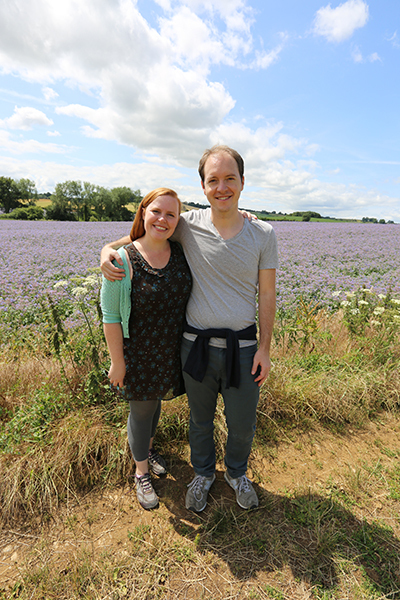 My husband Adam helped me put together our itinerary and travel plans, and we spent three weeks traveling in and around Birmingham and Oxford. Here are just a few of the many research highlights from our trip. When Tolkien was a boy, he spent some idyllic years in Sarehole, a village about seven miles outside of Birmingham. Today, the “village” has been completely engulfed in Birmingham’s sprawl, but it was wonderful to see that many key areas have been preserved, including the large Moseley Bog, which is thought to have inspired Tolkien’s forests. The flour mill is still working and houses a small Tolkien museum (he paid to have Sarehole Mill restored), and the cottage that he lived in sits nearby. There were many instances where being in the real locations influenced my approach to the artwork. When their mother died, Tolkien and his brother moved from the beautiful countryside into the industrial neighborhood of Edgebaston in Birmingham to live with an aunt. In the neighborhood stands the waterworks tower, and the tower of Perrott’s Folly, which are thought to have inspired the title for the second book in THE LORD OF THE RINGS trilogy. After seeing the towers, we tracked down the aunt’s house, and I realized how close they were to each other. In that moment, I knew I had to add the towers in the background of the page showing John Ronald and his brother arriving at the aunt’s house. Tolkien was an altar boy at the nearby Oratory, where his guardian, Father Francis Xavier Morgan served mass. I was able to directly use this photo, which we (discreetly) snapped inside while visiting, to create the image for this page. I’m not sure I would have thought of this angle had I not been there in person! The visit to Oxford was especially inspiring — we were able to hire a guide who could tailor a tour specifically towards Tolkien’s time as both a student and then professor there. I squeezed some key landmarks into the artwork; the Bodleian Library, the Bridge of Sighs, and the Sheldonian Theatre. A Tolkien-centered visit to Oxford could not go without a meal at ‘The Eagle and Child’ pub, where Tolkien met with his writing group ‘The Inklings’ (which included his friend, C.S. Lewis) on a regular basis. There were so many moments, pieces of information, and details from this trip–and from Tolkien’s world–that inspired me, and I worked to fit as many into the illustrations as I could. 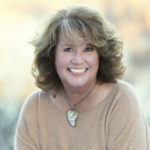 Caroline McAlister did a wonderful job of creating a picture book text that highlights the key moments in Tolkien’s life that led to his creation of Middle Earth and its stories. 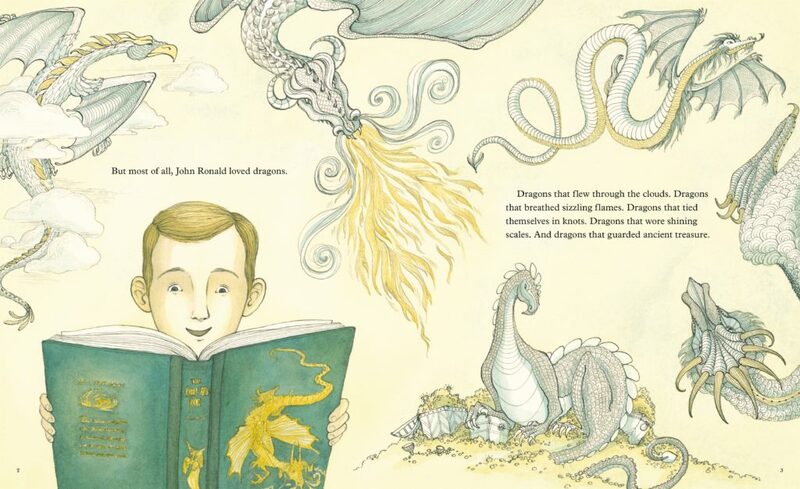 By making a picture book biography about Tolkien, we hoped to create an inspired way to introduce children to this beloved author. I hope that you will check this book out, and if you like it, please share with your bookstores, teachers, librarians, kids, and all fans of Tolkien’s work! 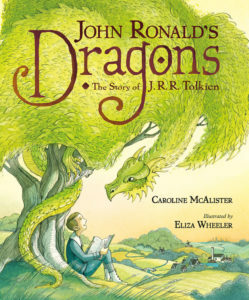 Caroline McAlister, Eliza Wheeler, John Ronald's Dragons, Tolkien. Bookmark. Wow, Eliza! This looks so amazing. And your trip to England is fantastic. Best of luck with the book. What an amazing look at the creative process. And I must have this book. When I can’t sleep, I think about dragons too. I love that, Kell — thanks so much! Eliza, What an incredible book and adventure! I can’t wait to get my copy. Beautiful work! Thank you for ‘illustrating’ the fruits of research and of using reference-excellent post. I LOVE your work. Your perspective skills rock! Oh my word, such beauty! I can not wait to read, and to admire, this book! Congrats!!!!!! 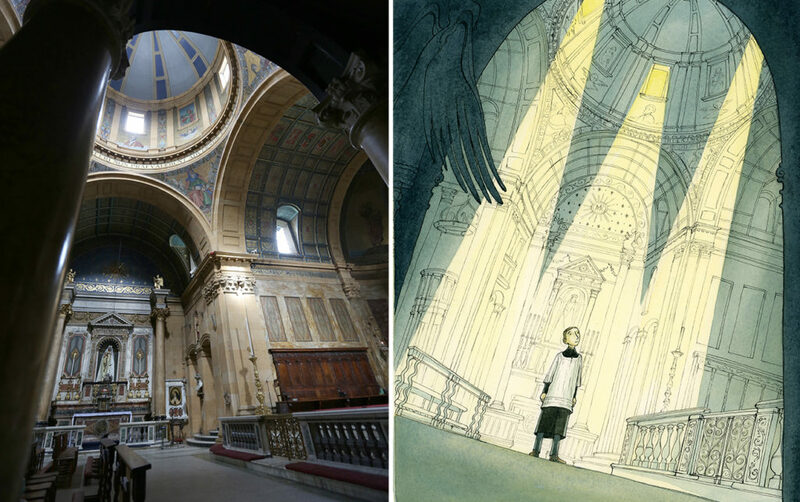 I love how the truth of the places was captured in the illustrations. Fascinating! OH, my — I could just live in this post forever! Thanks to you and the author for writing and illustrating this book and for sharing your research story! I’m so glad you made the trip. You are an amazing artist. I can’t wait to read / look at the illustrations of this book. Thanks. This post is soooo interesting and enlightening. Thanks! I’m getting this book for my grandson’s birthday gift. He loves Tolkien. Beautiful work, Eliza!! I can’t wait to get a peek at this book! I am a huge fan of both J.R.R.Tolkien and C.S. Lewis. Good luck and thank you so much for sharing your awesome talent. This is lovely! I love seeing the photos you took on your trip. I am giving a talk at Guilford in April about how I wrote the book, and I would love to show folks this blog post so they can see how the illustrator goes about doing her own research. I am so excited about the release. I feel like I’m having another kid. Great idea, Caroline! You wrote a beautiful book. Thank you, Caroline!! This is a huge cheers, from one coast to another, on this wonderful project! GREAT job. 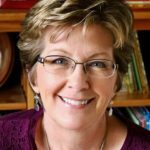 I would love for you to be able to share any of this in your talk, too! Awesome, Caroline! I’m SO excited, too! Happy to have you share any of my photos and visual research in your talks. Congrats! I’m a big Tolkien fan and I cannot wait to read this book and see your beautiful illustrations. Thank you for sharing your research photos and sneak peak of some illustrations. What a deliciously gorgeous book! How wonderful you got to spend time there, Eliza–it must have been incredibly inspiring. What a gorgeous book! Congratulations! P.S. I love the Oratory illustration and seeing how it came about. I can’t wait to get this book! (Our family are huge Tolkien fans, so multiple copies, I think.) I’m so glad that you went to England to do your research. I swear that something in the air there inspires creativity. Congrats! OMG, Eliza, what a work of art! This is one I’m going to have to buy to introduce my grandkids to J.R.R. Tolkien! Your travel of research is worth its own book! Thank you for including the photos from your itinerary. This is amazing, Eliza! 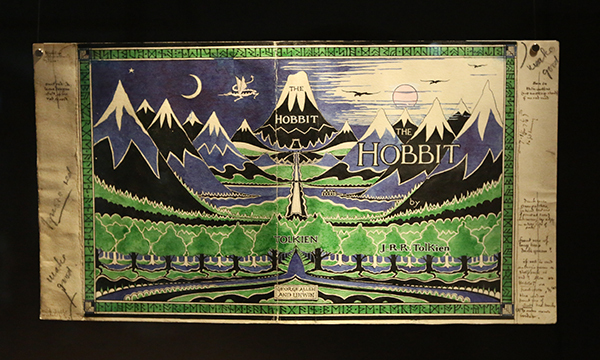 Your artwork is PERFECT for Tolkien, and the work and thought you put into your process is so, so impressive! You’re inspiring. You are sizzling hot! EW and JR together in one book? Definitely taking up residence on my shelves, and my heart! Wow! What an amazing research and writing opportunity (let alone painting). I can’t wait to read it. I am impressed with the level of work you put into this, and it so clearly shows. Great job. I can’t wait to see the whole book. Thank you for sharing it. Congratulations, Eliza, on such a glorious book! Can’t wait!!!!! Thanks to each and everyone for all the sweet, excited, supportive comments! Can’t wait to read your latest, Eliza. 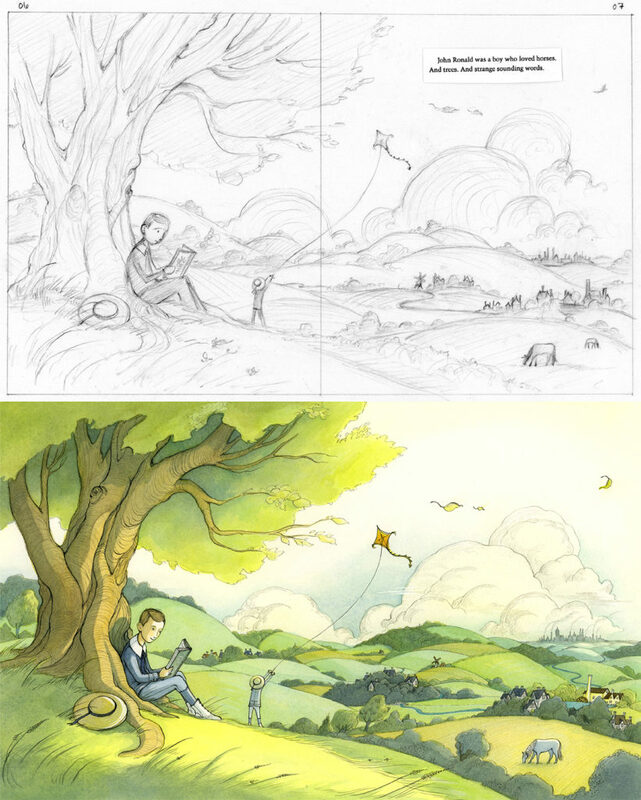 I love how you found inspiration in your UK travels & incorporated them into your illustrations. Thanks for sharing your photos & artwork.